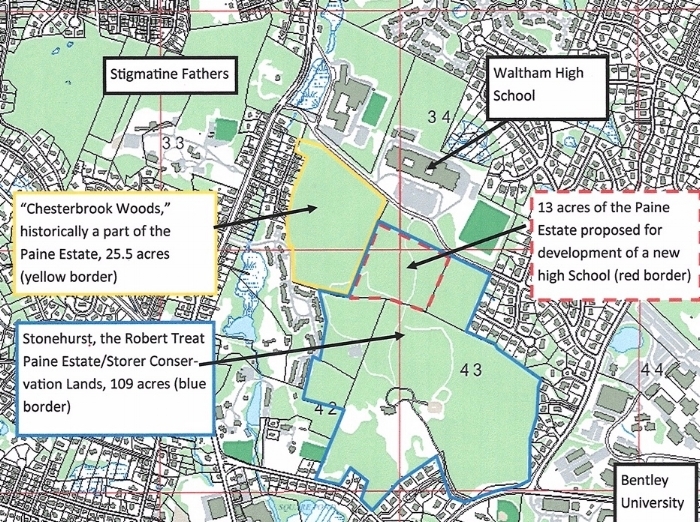 The Waltham Land Trust has closely followed the various proposals to potentially develop the Storer Conservation Land, Chesterbrook Woods (aka the Coleman-Stanton Property), and portions of Stonehurst/The Paine Estate in order to move forward with the construction of a new high school. The Waltham Land Trust firmly opposes these proposals. While WLT understands and appreciates the urgent need for a new high school, it should not be built at the expense of honoring the City’s prior longstanding commitment to conservation of this land. Because these lands are unique and irreplaceable, the Waltham Land Trust has joined the Coalition to Preserve the Paine Estate together with Friends of Stonehurst to advocate for the preservation of this green space. On November 16, 2017, the Waltham Land Trust released an official statement in opposition to the proposed development of the Chesterbrook Woods. On March 30, 2018, WLT again voiced its opposition to similar proposed uses of the Storer Conservation Land. In April 2018, the Friends of Stonehurst and Waltham Land Trust submitted a preservation packet to City officials that included letters, articles and a petition representing thousands of individuals and organizations throughout the region and country who oppose the plan to develop any part of the Paine Estate for a new high school. 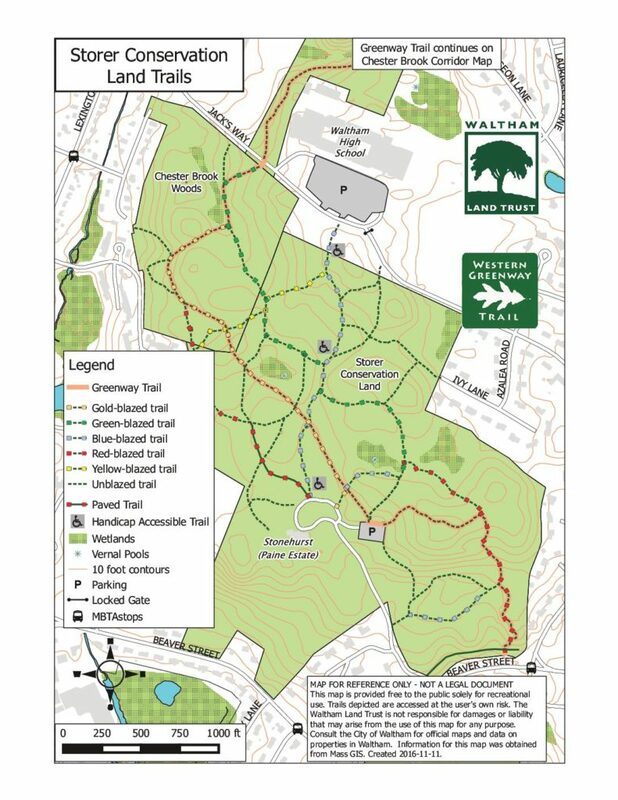 WLT also opposes the proposed construction of a fence that would divide the property and obstruct use of the only wheelchair accessible forested trail in Waltham. If this historic land is developed, Waltham will lose an incredible and irreplaceable part of its history and green space. Theodore Storer and other Paine heirs donated and sold the 109-acre Robert Treat Paine Estate/Storer Conservation Lands to the City of Waltham in 1974 with restrictions “for the purpose of maintaining said parcels in a predominantly natural, scenic, green and open condition forever.” Since then, the City of Waltham has honored the promise to preserve this land, and purchased 25 acres of adjacent woodlands, known as the Chesterbrook Woods, which are zoned as conservation land and have been merged with the Paine Estate and used for many years as a single contiguous parcel of green space. Designed by landscape architect Frederick Law Olmstead (famous for designing New York's Central Park and Niagara Falls Reserve, and Boston's Emerald Necklace), much of this at-risk land is designated a National Historic Landmark. The Waltham Land Trust’s position is that this land is protected by Article 97 of the Massachusetts Constitution. Article 97 states that the people have a right to enjoy their parks and open spaces and that the State and its Municipalities cannot use such lands for other purposes unless the transfer is approved by two-thirds of the State Legislature. The Massachusetts Executive Office of Environmental Affairs imposes additional requirements for transferring park land to another purpose, most notably the “no net loss” requirement: If 25 acres of protected land is “unprotected” and used for educational purposes (for example), then another 25 acres of comparable quality must be set aside for conservation. The Waltham Land Trust believes all of these requirements apply here. While the question of which publicly-owned lands are protected by Article 97 has been the subject of several court cases, the 2017 decision of the Massachusetts Supreme Judicial Court in the case of Virginia Smith and others v. City of Westfield appears to apply directly to the Chesterbrook Woods. The Court has consistently held in favor of conservation of land that municipalities have held out to the public as being protected, even if the deed or other documents do not legally formalize this status. The Waltham Land Trust will continue to advocate for preservation of this one-of-a-kind historic land. For more on WLT's position concerning the construction of a new high school, click here.